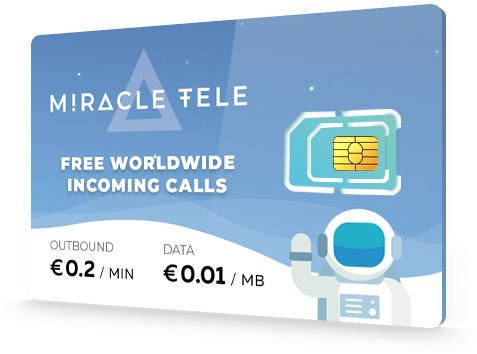 Miracle Tele is a virtual mobile network operator providing high-quality international call and browsing services on a revolutionary new SIM card. 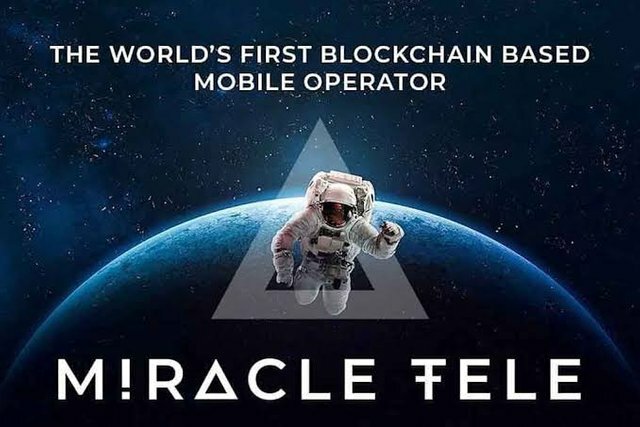 Miracle Tele is a global blockchain project which is designed to solve the problem of the high cost of roaming for travelers. The plans of the development team include the creation of a platform for the direct interaction of operators and specialized service resources with users of mobile devices. By eliminating the services of intermediaries. It will be possible to receive high-quality communications at the rates of operators in the country where the person will be located. In this case, you do not need to purchase a new SIM card, and the identification process will occur automatically. This groundbreaking SIM makes it possible for you to retain your privacy rights and earn biweekly rewards, thanks to the tokenization of the company’s assets. With the introduction of the Miracle Tele platform for blocking. Travelers will become full subscribers of any of the operators in the country where they keep their way. They do not have to buy a new SIM-card, while they also save their phone number. 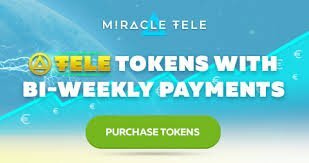 Each operator registered on the platform can easily place their tariff plans available for prepayment for services that will be presented as issued smart contracts on the Miracle Tele service. These service will be available to all other operators, as well as interested users. During the selection by the subscriber of the offer, a smart contract is issued with mandatory confirmation of subscriber data and payment transaction. WHAT ARE THE MIRACLE TELE BENEFITS? Make calls and use data during travel worldwide at great local rates with direct connection to local operators. No need to change your SIM-card or phone number. Next generation messenger packed with amazing communication features. Any operator can become global without complex network integrations. Direct access to international telecom market with millions of new customers. Increase in revenue through distribution of value-added services. The Miracle Tele App contains more than hundred functions, each being in high demand by users. For our current project, the most important functions are: Retaining your mobile number in the app during remote swapping of the SIM card profile. Subscribers will be able to receive incoming calls via an IP channel and also pay for local mobile service bundles in the visited country. Using Miracle Tele as the first client of a decentralized network based on blockchain technology which we are developing. Also in the application, it is possible to call and send SMS to any fixed and mobile subscribers, who do not yet have Miracle Tele, at low rates. Any mobile operator can publish their own prepaid plans (“Offers”) as well as smart contracts. These offers are visible to all other operators and their subscribers. Selecting “Offer” creates a new “request” for a smart contract with digital subscriber identification and a payment transaction. At the same time, the subscriber retains his valid SIM card with the old phone number. WHAT DOES MIRACLE TELE OFFERS? Miracle Tele is set to change the way the conventional telecom market works through the creation of a transparent and agile digital ecosystem that fuses an MVN model together with blockchain technology. Blockchain is the premise of our answer, since the collaboration between versatile administrators is brought out through shrewd contracts. There is no need in costly direct contracts and specialized reconciliation between organize suppliers. This permits any phone administrator (counting little ones) to rapidly (inside 24 hours) start offering their administrations to supporters of different administrators and to furnish endorsers with a worldwide administration at favourably rates. 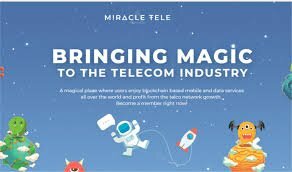 Miracle Tele ICO is dedicated to telecom industry and community. The company is scaling up to competition by expanding via blockchain. This is the first ever blockchain for telecom. 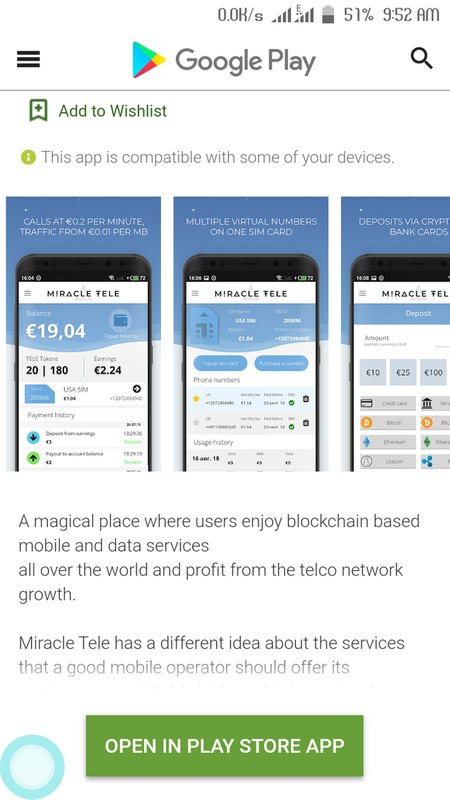 It is quite surprising to know it’s the first ever, No one has venture into the blockchain from telecom yet, except Miracle Tele. The inherent features of blockchain suit perfectly for telecom industry. The technology contains the blocks needed to create a framework for telecom. However, We cannot overlook some of the peculiar habits of the telecom companies to charge their customers. You can have multiple offers and discounts on calls or messages in your area but when asked to remove the roaming charges it becomes the serious damage to their business. Their major profit comes from the roaming calls and messages. It remains one of the top sources of earning for the telecom companies. Can we ever invent the technology to remove the barrier of roaming among the multiple telecom networks in a country or in the world? I think it could be one of the next step for the telecom as well as consumers, who are also travelers. Miracle Tele is a company in the telecom business for years. It has decided to put an end to the roaming network and bring the Global network on a single platform where they co-operate jointly. Their plan is to introduce the Telecom using Blockchain Technology, which runs on the smart contracts between the telecom operators. The telecom operator can design and publish its Smart contracts, which would offer charges for the users and other telecom operators who wish to join the blockchain network. Their app is most useful to the users and contains many functions. Some of the functions of the app are mentioned below. The goal of the Miracle Tele Blockchain platform is to eliminate all long, complex and costly inter-operator roaming procedures. It also tend to the changing needs of the telecom customers by offering them improved privacy, lack of bureaucracy, reduced rates, and value added services as well as freedom of access to financial tools via blockchain all in one place. Also to create a new market for thousands of telecom carriers opening affordable mobile services for silent roamers. Our Blockchain in Telecom ecosystem provides direct interaction between mobile operators and service-providers via smart contracts. It is believed that it will be the biggest revolution in the telecom by bringing the mobile operators, users and service providers on the same platform. We are bound to see more applications dependent on the technology developed by the MIRACLE TELE. In Conclusion, Miracle Tele Blockchain in Telecom is a service that allows mobile communication providers, users and operators to interact with each other directly without intermediaries, thereby using Blockchain technology to reduce the cost of providing mobile services beyond the country, in the roaming. A beta version of the Miracle Tele application with more than many features is already available for download on the APP STORE and GOOGLE PLAY. Thanks to this Miracle Tele platform, it became possible to connect to any mobile operator, make calls, send any types of messages. To please each other by video communication networks. The strengths of this project include an experienced team whose representatives have extensive experience both in telecommunications and in blockchain development.